Here’s an awesome recipe I made recently for our rockin’ Chief Operations Officer Norman’s Brambleversary. This would be a great way to get rid of leftover holiday candy canes…are they still good in March? Anyway, regular peppermint candies work just as well and are available year-round. Try out his recipe for a hint of winter mint if you’re already missing those chilly evenings fireside. 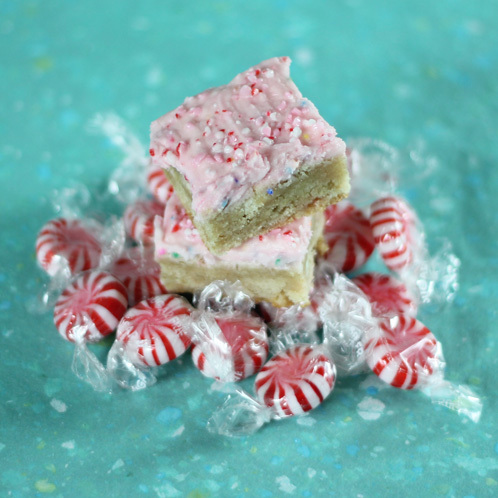 I was inspired to create this recipe in the hopes of finding an easier way to make the amazing Peppermint Shortbread cookies my Grandma Faiola made us every year. They are this insane labor of love, taking around 3 hours to complete the shortbread-filled-with-pepperminty-goodness creations and while these were delicious, Grandma still takes the prize for yummiest cookie. Norm still loved his Brambleversary cookies and, we love Norm. =) Enjoy the recipe and if you make them, eat them and make a wish for a Norm in your work life. 1. Preheat oven to 375F. Grease a large 11×17-inch rimmed baking sheet. Line with parchment paper and grease paper as well; set aside. 2. In a medium bowl, whisk together flour, salt, and baking soda. 3. In the bowl of an electric mixer, cream butter and sugar until light and fluffy, about 3 minutes. Add eggs, one at a time, mixing well after each addition. Add in vanilla. Add in flour mixture, mixing until just combined. Stir in butter mints. 4. Spread batter evenly onto prepared baking sheet, smoothing top. Bake until light golden brown and a toothpick inserted in the center comes out clean, about 20 to 25 minutes. Transfer to wire rack to cool completely. 5. While cookie is cooling, make frosting: in the bowl of an electric mixer, beat butter until fluffy, about 3 minutes. Add peppermint extract and salt. Add confectioners’ sugar, a little at a time, beating until well combined. Add milk, a tablespoon at a time, until frosting is smooth and fluffy. Add a few drops of food coloring if desired. 6. 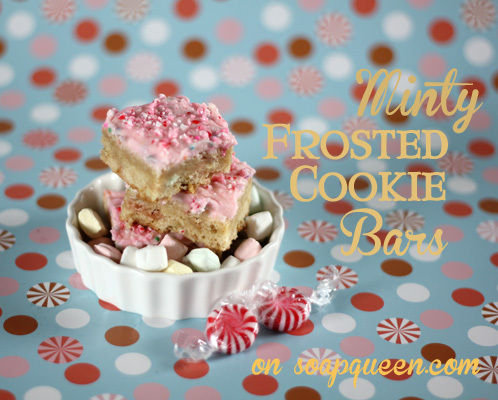 Spread frosting over cooled cookies, sprinkle with crushed peppermints, then cut into bars. Try these with a cup of hot chocolate or my personal favorite, Choffy! Next Post: What are Water White Fragrance Oils? Thanks so much for the recipe they look lovely. What an interesting idea – adding crushed dinner mints inside the cookie! Gonna have to save this recipe! I’m guessing adding a few chocolate chips might be good, too. I have a couple of ideas for recipes I’d like to formulate trolling around in my head, nagging me – a coconut, banana & chocolate cookie and a “Bananas Foster” ice cream, just like the uber-expensive Haagen-Dazs kind I just tried. O.M.G. – it is good!